AA Action Waterproofing was originally founded 30 years ago, give or take, and in that time we’ve faced off against a lot of different challenges. Many of our clients came to us after the worst had happened: an insect infestation, an outbreak of toxic black mold, or a deep pool of dirty, silty water left behind by a flood. But no matter what we faced, whether it was a flooded crawlspace in Frederick or a leaky foundation in Linthicum Heights, we never saw a basement or crawlspace we couldn’t handle. If your home doesn’t have a full basement, there’s a good chance that you have a crawlspace instead. Crawlspaces are excellent for providing access to the pipes, wires, and ducts that run underneath the floor, but at the same time it isn’t quite as protected against the elements as the rest of your home. For instance, when it gets humid outside (something which happens often in a state like Maryland), it gets humid in the crawlspace, too, and that humidity carries enough moisture to allow mold to start growing. Fortunately, there’s a way to keep mold, moisture, and excess humidity out, and it’s called encapsulation. By lining the crawlspace with solid, vapor-resistant plastic materials, you can keep your crawlspace safe and dry. This means you can also use it as extra storage space for items you don’t need on a day-to-day basis. That being said, there are reasons to scrub the mold away which go beyond removing the unsightly mold colonies and the musty odor that comes with them. The strains known as “black mold” emit an airborne toxin which produces symptoms similar to a cold. Black mold can make staying at home uncomfortable, and it can be actively dangerous to someone with a weak immune system. Fortunately, mold remediation can hunt down the excess mold colonies and bring the spore count down to safe levels. 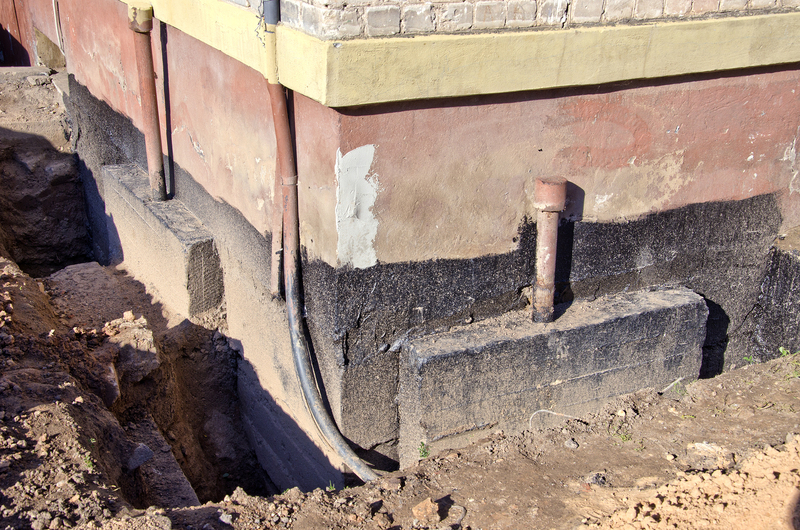 • Backfill materials which allow water to permeate down to a level below the foundation. Still, there are ways to deal with a leaky foundation in Linthicum Heights or a clogged basement drain in Baltimore that go beyond the basics. Sealants keep water out, new drainage systems redirect it to where it ought to go, and by using the same encapsulation materials from before, you can protect the basement interior from water damage. Foundations are the most important part of any building’s structure, hence why the word refers to any sort of solid basis. A good foundation should avoid bending, breaking, or sliding, and it should hold the building steady and straight for decades or even longer. Pulling this off is harder than it may first look: buildings are extremely heavy, especially once you start adding extra floors, and the ground has ways of moving around which are hard for a human to notice. As such, when it comes to cracks in the foundation it’s less a question of “if” and more “when.” Not every crack is catastrophic and many you can repair yourself, but if there’s a leaky foundation in Linthicum Heights or any other part of the larger Baltimore-Washington-Arlington area, AA Action Waterproofing is the contractor you should contact. Our first inspection and estimate are free, and you’re under no obligation to go any further with us than you want. Our business works with clients who live as far away as Pennsylvania and Delaware, but you can always count on us to provide the best possible service no matter where you live. Whether you need us for a mold outbreak in Newark or a leaky foundation in Linthicum Heights, AA Action Waterproofing will handle your problem as quickly, efficiently, and inexpensively as possible.